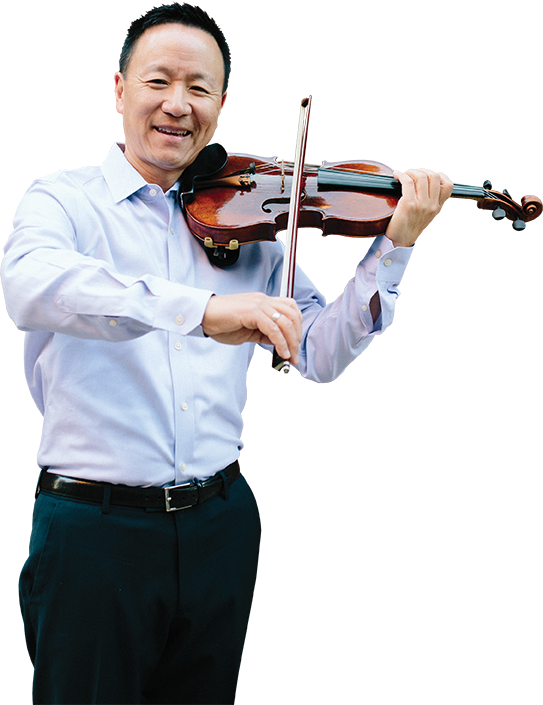 Highlights of Mr. Kim’s 2018-19 season include serving on the faculty of the New York String Orchestra Seminar; appearing as soloist with The Philadelphia Orchestra; teaching/performance residencies and masterclasses at The University of Texas at Austin, Rice University, Manhattan School of Music, Bob Jones University, Rowan University, West Chester University, the Taipei (Taiwan) Academy and Festival, and continued appearances as concertmaster of the All-Star Orchestra on PBS stations across the USA and online at the Kahn Academy; a solo performance on a soon-to-be-released CD with the Westminster Choir; as well as recitals, speaking engagements, and appearances with orchestras across the United States. Mr. Kim has been awarded Honorary Doctorates from Eastern University in suburban Philadelphia, the University of Rhode Island, and Dickinson College. His instruments are a J.B. Guadagnini from Milan, Italy ca. 1757 on loan from The Philadelphia Orchestra and a Michael Angelo Bergonzi from Cremona ca. 1754. Mr. Kim resides in a Philadelphia suburb with his wife Jane and daughters Natalie and Maggie. He is an avid runner, golfer, and outdoorsman.